The most celebrated movie award comes again, Oscar 2015. I feel that this year’s nominees are more predictable and less controversial. But…Compared to last year’s awarding night with Ellen Degeneres as the MC, it is sad that I must say Neil Patrick Harris did less impressive job, even after he showed up naked on Oscar’s stage. Ellen was naturally funnier and seemed to be more spontaneous. I want Ellen back on the Oscar’s stage next year, please! I am happy with all the nominees. But Gone Girl should have been there as well, because it is just as good as the other nominees. Why Gone Girl is not on that list? It is because the theme is less grand compared to the other nominees? Because it doesn’t involve the story of a genius, or a revolution, or a depressed American? Why Jake Gyllenhaal is not on that best actor nominee list? His performance in the “Nightcrawler” deserved a nomination. Anyway, Oscar in this category is well deserved. Eddie did an extra ordinary job acting as Stephen Hawking. Not only that he can mimic his gesture and convincingly showed how painful ALS disease can be, but also the way he alter his voice before it gradually disappear, that alone was awesome! The winner in best actress category, Julianne Moore, acted as Alice, a linguistic professor suffering from early onset of alzeimers disease. So both actor and actress were playing characters with acute disease. In addition to that, I found Still Alice very captivating. I bursted into tears, literally streaming down my cheeks, watching one of the scenes in that movie, as if I could feel Alice’s world crumbling as she’s losing words due to her disease. Despite the result, The Grand Budapest Hotel remains the best picture in my heart. It is heart warming, evoked different rays of emotion, told a beautiful story, magnificent cast and impeccable production design. It is a complete package of a great movie. Birdman is also a great movie, but it evoked mostly, if not entirely, depressed feeling and that drumming sound was sometimes too loud and annoying. Now, a quick look from the red carpet. After her awful outfit in the Golden Globe last month, why Kiera Knightley is wearing another grandma dress? Is she pregnant? Even pregnant women could pull better outfit on the red carpet. While most people showed up wearing black, white or red (to be on the safe side I suppose), Emma Stone looked gorgeous in her moss-green gown. She kept on being awesome after showing up in a very edgy outfit in the Golden Globe. 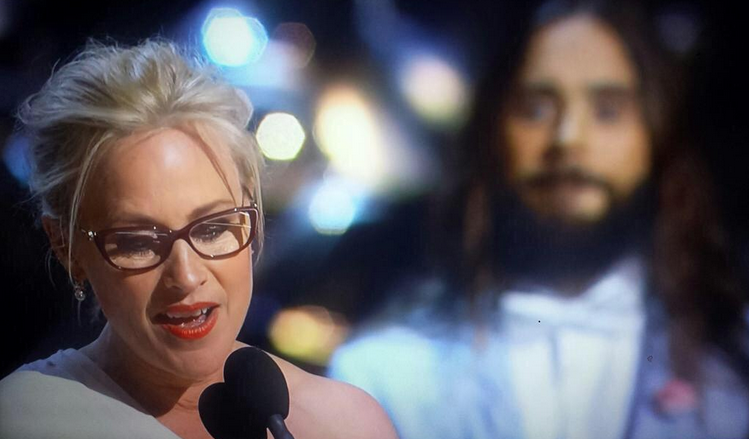 And Jared Letto is probably trying out a new career as a weather man. Categories: Bicarafilm | Tags: academy award, benedict cumberbatch, eddie redmayne, film, inarritu, julianne moore, movie, oscar | Permalink. Buat yg jarang ke bioskop banyak judul2 film yg baru kedengeran. Bisa ditonton dimana yah? kayaknya benar. seperti sempet liat beberapa waktu lalu di ellen degeneres show. Oh my… Clint Eastwood is still around. How old is he? Benedict Cumberbatch was Voldemort in HP, right? Oh, I was wrong. They look alike. Duhh neng keira… but still I love her! Hahaha… jadi banyak ya listnya? Iya, ih, jadi banyak list film yang bisa ditonton. Tapi hasil download. Entahlah, mau ke bioskop kayak malas aja gitu. Soalnya, pernah sesekalinya pengen banget nonton bioskop usai liputan malah tidur pules. Agree with you on fashion dept, what’s wrong with Keira??? She looks frumpy and unattractive at all. Maybe she’s setting a new trend? I wonder what it’s called. Totally agree Bil. TGBH was captivating on so many levels!